The Altis Hotel has the following facilities reception (not 24 hours), safe (local charge), Wi-Fi, bar, swimming pool, gardens and parking. All the rooms have exterior insulation, a balcony with a sea view or mountain view, the plain of Malia and of course the gardens. The hotel offers triple, double and single rooms with twin beds. Every room has en suite bathroom with shower and is equipped with hairdryer, individual air-condition, a small fridge, satellite television and radio.Room facilities include bathroom, hairdryer, TV, small fridge, air conditioning (local charge) and balcony or terrace. 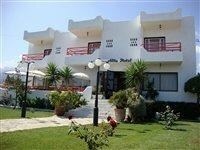 Address: Beach Road Stalis - Malia, 70007, Malia, Crete, Greece.